If you chance to travel in the Venice area and in the province of Padua in particular (in this case the village is Piazzola sul Brenta, one of the many nice places along that riverside filled with an unbelievable heritage of Venetian Villas) you may take into consideration a stop at Villa Contarini for the recently opened exhibition dedicated to the war drawings of Giuseppe Cominetti. The inauguration was on the 21st of February and there will be time up to the 2nd of June (public holiday in Italy) to visit this event. Giuseppe Cominetti (1882 - 1930) was a divisionist artist and later protagonist of a short and shy participation to Futurism, the movement founded by Filippo Tommaso Marinetti. The link was possible also thanks to Cominetti's long stay in Paris, where Marinetti ended to establish his "headquarter" and loud megaphone. The war's outset, far from being a total stalemate for Cominetti's art, turned into an unexpected possibility to investigate new paths of his sign. The Villa Contarini exhibition follows 85 years later the one in Teatro Quirino in Rome, projected in full development of the Fascism in Italy and close to the artist's death. Today we are probably free of that kind of bombast used to describe his work; his drawings taken first in the Ardennes then in the Monte Grappa where he volunteered can be approached with a different state of mind, as a powerful new testimony of warfare, different from the one we get with photography or videos. The layout of the exhibition gathers 80 works obtained with pencil and oil based chalk on pounce paper. 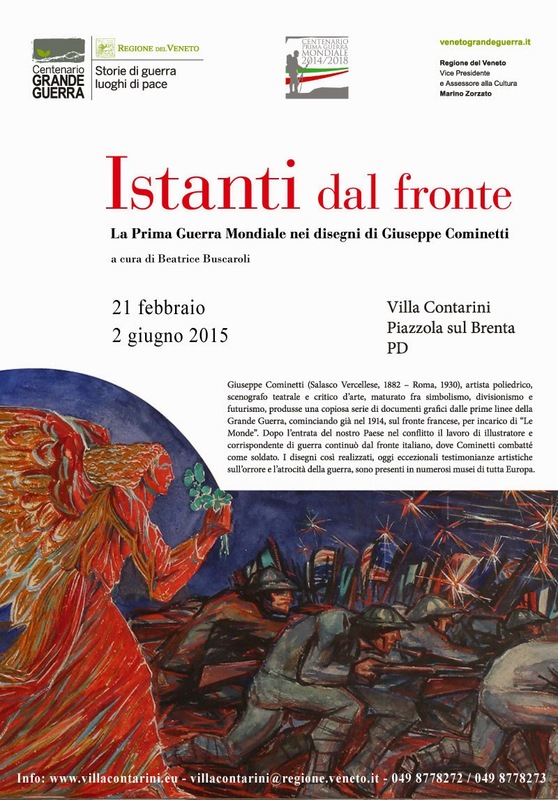 "Istanti dal fronte. La Prima guerra mondiale nei disegni di Giuseppe Cominetti"